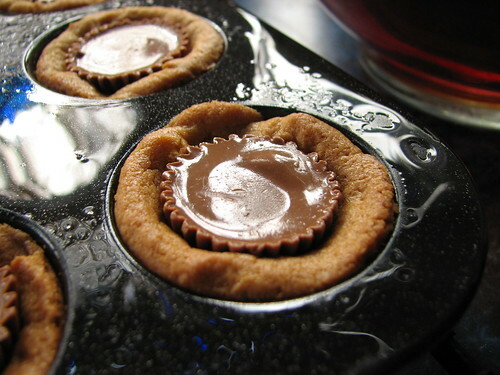 I made more peanut butter cup cookies today. My dear friend Carolyn had said the recipe reminded her of Moose Tracks ice cream. 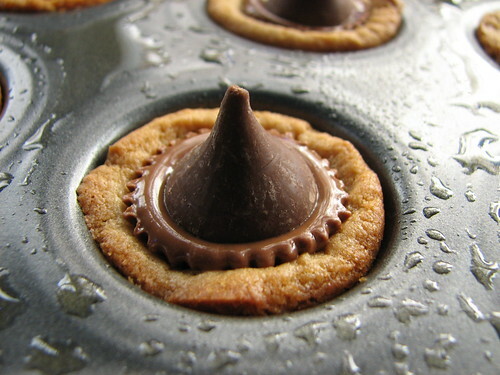 That made me think the cookies needed a big chunk of chocolate, so I decided to add a Hershey’s Kiss to each one. 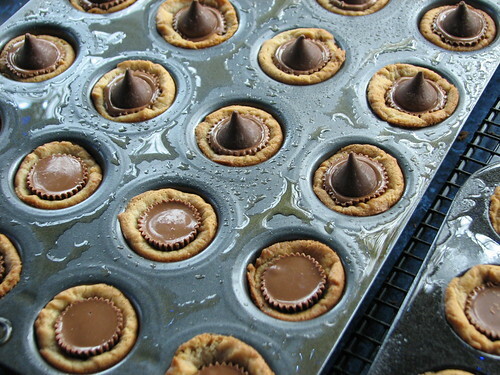 I waited until the chocolate of the peanut butter cup was totally melted…about ten minutes…then gently pressed a Kiss on top. You can see in this picture that part of the chocolate is shiny and part is still dull. Wait until the entire top is shiny before pressing the Kiss into the top. If you don’t push the candy in too deeply, you retain the chocolate crimping around the peanut butter cup which looks pretty. This entry was written by ~~Rhonda, posted on November 13, 2008 at 3:59 pm, filed under cookies and tagged Hershey's kiss, peanut butter cup cookies. Bookmark the permalink. Follow any comments here with the RSS feed for this post. Post a comment or leave a trackback: Trackback URL.